OnSite Environmental Inc. (OnSite) is a full-service environmental laboratory that offers inorganic, organic and general chemistry analyses. We have been providing high quality analytical services to industrial, commercial, and governmental clients since 1992. 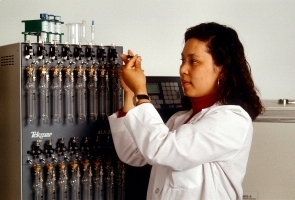 Our laboratory is certified by the State of Washington for the analysis of Soil, Sediment, Water, and Waste matrices. Below are our accreditation letters. The analytical methods we utilize are based on established procedures such as those published by the US Environmental Protection Agency (EPA), the Washington State Department of Ecology, and the Alaska Department of Environmental Conservation. We also follow many regional or locally prescribed methods. Our goal is to establish a close relationship with our clients to ensure compliance with all regulatory requirements. OnSite's continual investment in the most current scientific instrumentation has allowed us to meet the stringent detection limits required by different regulatory programs. Over the years we have developed relationships with individuals from each regulatory agency to ensure that we are kept abreast of potential changes to analytical methods and/or regulations. By doing this, we are able to be at the forefront of an industry that is constantly changing. a variety of instruments and meters for turbidity, distillation, titration, and other tests.